Turin, 15 December 2017 – Fiat Professional took the “Light Van of The Year” award at the 2018 What Van? Awards for the third successive year with their Doblo Cargo. The Fiat Professional Fiorino was highly applauded in the “Small Van” category. 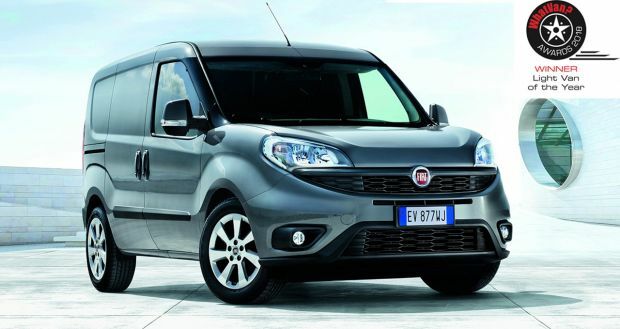 This just proves that Fiat Professional’s light commercial vehicle range is a success in the industry. The multi award-winning Doblo Cargo has many features such as a one tonne payload, 5.0 m3 load volume, a 1.3-liter and 1.6-liter diesel engine and a 1.4-liter petrol engine which makes it the first choice for fleet operators and for the judges. Other characteristics include first-rate dynamics and comfort which is enhanced by its bi-link suspension, the segment leading load and volume capacities, solidity, toughness and widespread range. James Dallas, Editor of What Van? said that: "The fact that the Doblo Cargo has won the Light Van Award for three years in a row provides compelling evidence of its enduring quality. Top notch handling and a high standard of build quality are among the Doblo's virtues, but it is the breadth of range that really sets it apart - with load volumes of 3.4m3 to 5.0m3 and payload capacities extending from 750kg to a meaty 1,005kg." Richard Chamberlain, Fiat Professional Country Manager, accepted the reward and said that: "We are hugely proud of both the Doblo and Fiorino and are delighted to see them claim two more high profile awards for our brand. These awards are particularly special as they are given by a panel of experts who truly understand the LCV market and who know what van customers are looking for. The awards are further evidence of the strength and competitiveness of Fiat Professional's van line-up, which has recently been bolstered by the arrival of the Talento and Fullback pick-up, and underline the huge strides the brand is making as it grows and enhance its reputation."